M&M S. Residence, Historic Naples FL. This was my first tropical project and one that required copper fixtures. I used Vista, which I was quite pleased with the quality. As far as controls, I just used a digital timer and synced the other transformers to it. I loved the architecture of this home, especially the arbor. I used stems to bring the fixtures out to shine back on the flowers, getting the dormers lit was important as well, and a little challenging. The use of the copper fixtures meant handling all the components with gloves, so the fixtures would patina evenly. This added time as most of the lights have intricate parts, but the result was well worth it, the lights are gorgous! Other than the former police dog that was now the clients pet(seen here with my children) the project was a great one, and being within walking distance to the beach didn't hurt either!! This question is one that is always asked by homeowners and builders alike, usually followed by how much does it cost and what is its relative value to my home or project. Good questions to ask and great answers are available! Besides providing the obvious benefit of adding security(lets face it, what thief or vandal is going to be drawn to the most lit house on a street? ), you can enjoy your home well into the night. Architectural features are no longer only able to be viewed during daylight hours. 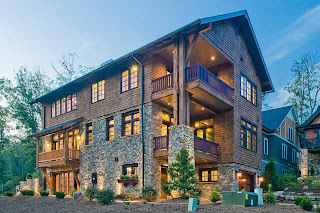 In the first picture posted I am highlighting an amazing home built by Living Stone Construction in the Village of Cheshire in Black Mountain, NC. This home was constructed of quality materials to high design standards. Notice in the photo the porches, patio and stonework. this next picture is the view from the street, with just the front porch light on, which is typical of most ho mes. Now look at the next picture with wall and pier lights added. The next set of photos are a view from the front of the house looking down the street, again, only porch lights are on. The next picture is with the the low voltage exterior lighting, including path lights and up lights. The next set of pictures is the back of the home by the garage doors. 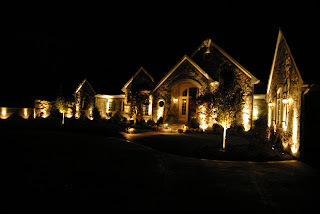 As one can see, exterior lighting can make a home or any structure come alive at night. I will go over the control options in another post. 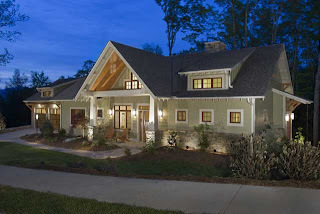 This is a wonderful home built by Living Stone Construction for William & Elizabeth Green. 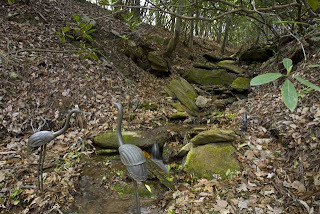 The home is a true mountain retreat, surrounded by awesome natural beauty. I wanted to highlight that beauty as well as the amazing landscaping done by Greenmeadow. I used the Leviton Vizia RF system to control the lighting, which was all Kichler, and a Touch Panel by Superna to automate the home. I tried to make all lights and lighting concepts fit in the environment of the mountain. This is the lakefront estate of Mark Hanna, a Cleveland industrialist from the Rockefeller era. This particular structure is the old carriage house, it was restored and turned into a beautiful home and is currently occupied by the wonderful Jack & Jan Borkey. I used a Leviton Toscana to control the lights, and I used Kichler & Vista lights. The horse path light was selected to capture the heritage of the home. I installed moon lighting in the trees to acce nt the path. I was very honored to receive this prestigious national award. 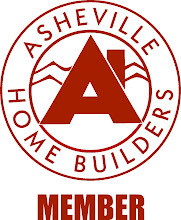 I am very grateful to the Home Lighting Control Alliance (HLCA) for their support and encouragement, and most thankful to Joe Borkey for letting me light up his home! 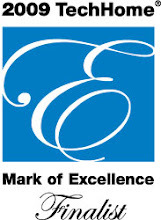 I also wish to thank the Tech Home/Mark of Excellence team for an amazing event. This was another fun project where I was given cart blanche to be creative. We spent another summer here as well. There were some very challenging areas to get lighting in and on (like the rock walls and waterfalls), but we worked closely with Landmark Construction, who installed all the walls and falls & pools. I used the Leviton Toscana to control the lights. Welcome to my blog! I am using this as a way of posting projects so my work can be viewed by customers and future clients as well. Enjoy and feel free to leave comments or ask questions.